This year, New Year’s Day fell on a Sunday, which means our most recent pork-centric Sunday dinner took on a familiar, annual theme. 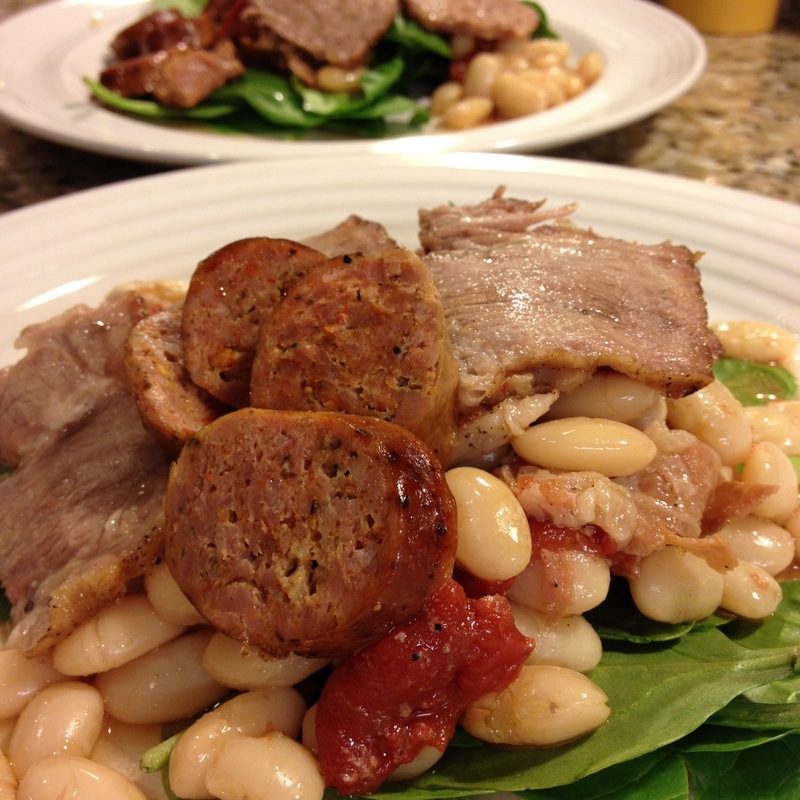 Why I started making this Italian pork-and-beans dish to celebrate the new year, I do not remember. I think at one point I may have claimed New Year’s Eve or Day as my holiday to spend in the kitchen preparing a fabulous dinner. At some point, I also may have claimed — hoping on some level — that I simply must be part Italian, though none of my ancestors were from anywhere near the Mediterranean. I do remember making fagioli for the first time on a cold a New Year’s Eve in Salt Lake City, and I’ve made it many years since, in Chicago, in Venice and now in Portland. My recipe combines two versions I found in Saveur magazine (November 2000), and while the ingredients are few and simple, the aroma from the oven is comforting, warming, homey. Why we have not made this for any other occasion is beyond me; it’s the essence of a one-pot meal, and incredibly easy to prepare. In the past, I’ve used only sausage as the accompanying meat, but this year we decided to braise pork shoulder with the beans. Next time we make it, I’d love to play with the ingredients and perhaps substitute pork with lamb, and sage with thyme or rosemary. Put the beans in an earthenware pot or a dutch oven, and cover with cold water. Set aside and let soak overnight or at least 4 hours. Drain and add cold water to just cover the beans. In a skillet drizzled with olive oil, lightly brown the sausages. Remove and set aside. Salt and pepper the pork shoulder, then using the same pan, brown it on all sides. Remove and set aside. Add the prosciutto, tomatoes, garlic and sage to the beans, and season to taste with the salt and pepper. Drizzle with olive oil. Place the pork shoulder in the center of the beans, gently working it into the liquid until it’s partially submerged. Place the sausages atop the beans as well. Cover and bake until the beans have absorbed all the liquid and are tender, about two hours. A meat thermometer placed in the center of the pork should register 160 degrees. Remove the pork shoulder and the sausages and cut into slices. Serve beans and pork in bowls or deep plates with perhaps a good crusty bread to sop up any juices.